The Patriots defense shut down Patrick Mahomes early, and Tom Brady closed the show late. The New England Patriots are headed to the Super Bowl for the third year in a row, because they’re an eventuality that can’t be stopped. When the Kansas City Chiefs scored a go-ahead touchdown with just over two minutes left in regulation, you already knew that Tom Brady would lead a touchdown drive to save the day. And when the Chiefs got a game-tying field goal, you already knew how overtime would go once the Patriots won the coin toss. New England surgically picked apart the Chiefs defense on a 13-play, 75-yard drive that was punctuated with a 2-yard touchdown by Rex Burkhead that ended the 37-31 win for the Patriots. Next up are the Los Angeles Rams, who punched their ticket to the Super Bowl with a 26-23 overtime win over the New Orleans Saints. It’s another high-powered offense and lackluster defense. If the AFC Championship was any indication, the Patriots can find a way to beat both. At halftime, the high-powered Kansas City Chiefs offense had only 32 yards in the AFC Championship and was facing a 14-0 deficit. On the third play of the second half, Patrick Mahomes uncorked a 54-yard bomb to Sammy Watkins that set up the Chiefs deep in New England Patriots territory. The next play was a 12-yard touchdown pass to Travis Kelce and — just like that — the Chiefs were back in it. That’s who Mahomes is. He’s lightning in a bottle, who couldn’t be stopped altogether by any defense in 2018. But the first half showed that Bill Belichick is still very capable of shutting down the most dangerous offenses by scheming them up — even if only for a little bit. Belichick’s defense double teamed Tyreek Hill on almost every play, brought consistent pressure on Mahomes, and was physical with all of Kansas City’s receivers at the line of scrimmage. It left the young quarterback without many options to throw to and not enough time to wait for receivers to get open. Mahomes is a wild man who can’t be contained on every play. Eventually he’s going to get a chance to uncork a few passes and he was brilliant when he did. It’s hard to praise a defense too much for giving up 31 points and three touchdown passes. But the Chiefs offense was held to 290 total yards and the blazing fast Tyreek Hill had only one reception in the game. That’s all Belichick and a Patriots pass rush that has been on a war path in the playoffs. If anyone can draw up a way to shut down the offense of Sean McVay and Jared Goff, it’s the Patriots. The AFC Championship was not the best version of Brady. He threw two interceptions and was fortunate to get away with a third that would’ve ended the game had Dee Ford not been lined up in the neutral zone. But Brady is the best postseason quarterback in NFL history, because — when the game is on the line — you know he’ll get the job done. He seemingly always does. 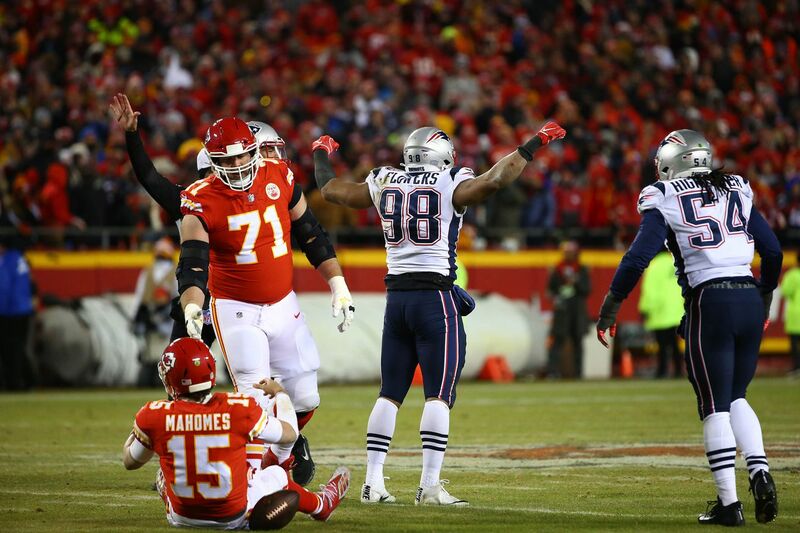 In overtime, the Chiefs put him in several tough spots, but Brady found Chris Hogan, Julian Edelman, and Rob Gronkowski with well-placed lasers to win the game. If the Patriots are in a Super Bowl, it’s probably going to be a great game that comes down to the wire. The Rams should expect to have to stop Brady in the final minutes, and — well — good luck with that.